Synopsis: When 10-year-old Andy Parker reluctantly goes to Grandma's house for the summer, all he can think about is how much he misses his dad in heaven and his best friend Anthony, who moved away. What will he do in this sleepy small town for the entire summer? But it turns out even cow dung can be interesting and something wonderful can come from rotten apples. FROM THE BACK COVER: Mom called this my Summer of Courage. She said that when you need courage the most is when you realize what's happened in your life and you decide to get up the next morning anyway. Mom and I did our best to keep going, to have courage. We prayed a lot. Sometimes I wondered if God ever listened. I prayed real hard for my dad to get better, but he died. I prayed that Anthony would be my best friend forever, but that was going to be harder now that we didn't live next door to each other. And I prayed that Mom would learn to cook something besides hot dogs and jelly sandwiches. I closed my eyes and prayed for God to send me a sign. Any sign he was listening. He sent me perch, Mrs. Sackets, and crow's nest. Awarded the Gold Medal for Intermediate/Middle Grade Fiction in the 2007 Moonbeam Children's Book Awards. Named a 2007 NAPPA Honors Book. From the Inside Flap&colon; Mom called this my Summer of Courage.She said that when you need courage the most is when you realize what's happened in your life and you decide to get up the next morning anyway.Mom and I did our best to keep going, to have courage. We prayed a lot. Sometimes I wondered if God ever listened. I prayed real hard for my dad to get better, but he died. I prayed that Anthony would be my best friend forever, but that was going to be harder now that we didn't live next door to each other. And I prayed that Mom would learn to cook something besides hot dogs and jelly sandwiches. I closed my eyes and prayed for God to send me a sign. 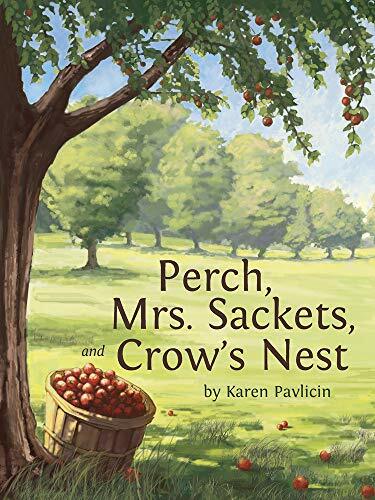 Any sign he was listening.He sent me perch, Mrs. Sackets, and crow's nest.